How do I access my Catalog beta environment? As a Catalog admin, the beta environment allows you to explore new features in Catalog without affecting your production environment. If you want to keep up on the latest beta features in Catalog, visit the Release Notes page in the Canvas Community. The beta environment is overwritten with data from the production environment every Monday. Any work or content you add to your beta environment will be overwritten. Any changes you want to keep in the beta environment must be made directly within the production environment before beta is reset. Currently, beta environments are only available for customers in the United States. Notifications are not sent from the beta environment. To log in to your beta environment, type [organization name].beta.catalog.instructure.com into the URL field. If your institution uses a vanity URL, replace the organization name with your full URL, and switch the periods to hyphens. For example, the beta site for www.example.com is www-example-com.beta.catalog.instructure.com. Your beta Catalog page will match the content in your production environment. You can tell you are in your beta environment as long as beta is part of your Catalog URL . Additionally, a pink bar displays across the bottom of the screen indicating you are in a Canvas Test Installation . Remember, beta environments will reset every week on Mondays and any content created in this environment will be deleted. If you want to save any content created in your beta environment, you will have to re-create it in your production environment. Beta environments are associated with beta Canvas environments. 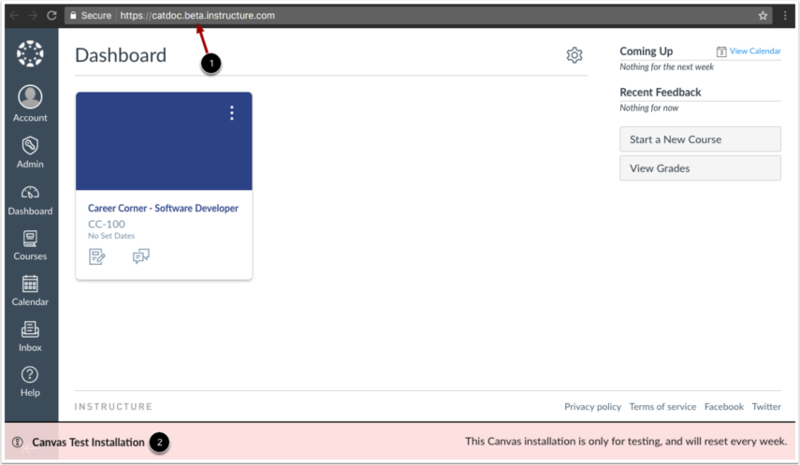 If you access Canvas from the Catalog beta environment, Canvas will also open in its beta environment. You can tell you are in your beta environment as long as beta is part of your Canvas URL . Additionally, a pink bar displays across the bottom of the screen indicating you are in a Canvas Test Installation . Canvas beta environments reset differently than your Catalog environment. For more information about Canvas beta environments, please see the Canvas Admin Guide. 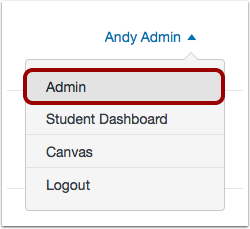 Previous Topic:How do I enable Canvas permissions for admins to manage a Catalog account? Next Topic:What customization options are available in Canvas Catalog? Table of Contents > Admins - Catalog > How do I access my Catalog beta environment?